Published Nov. 26, 2013 by Imperial Beach Patch. 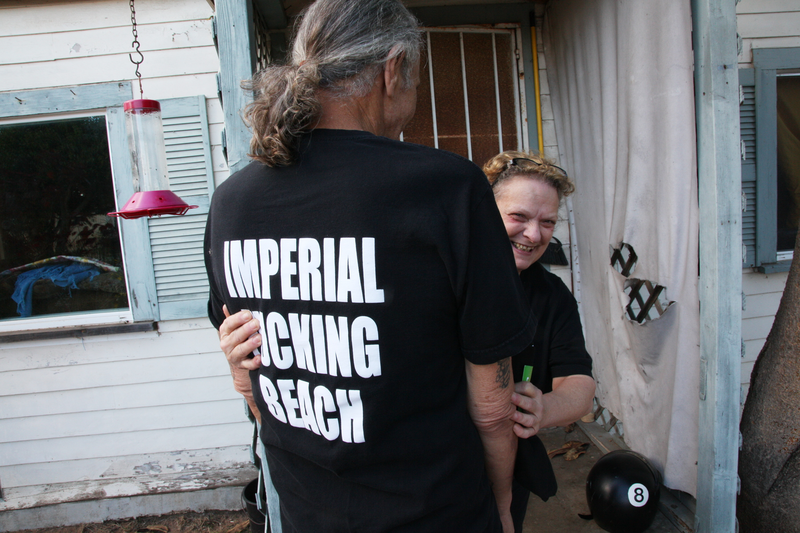 Cheryl Bushee lives on 3rd Street with her cat Pickles and has been in Imperial Beach for 40 years. “Several people have told me what a piece of sh*t I was for wearing a shirt like that. Or ask ‘Well what don’t you like about IB.’ I love IB That’s why I haven’t left yet,” Bushee said. Bushee wants to make her shirts popular with young people and skateboarders but does not intend to sell them to kids, she said. Shirts go for $20 and hoodies for $30. To purchase a shirt call 619-575-4982. Joe Powell can be seen wearing the shirt as he rides around South Bay on his 2000 Harley Davidson Sportster motorcycle to remember “the last of a wild freaking frontier” that Imperial Beach used to be. The shirts were made in memory of old IB, Bushee said. Development and the attraction of new businesses is positive but IB shouldn’t lose its small town feel or scrappy spirit. What do you think of the shirts? Proud? Ashamed? Do they say something about the spirit of Imperial Beach or what IB used to be? What do you think IB has gained or lost over the years? This entry was posted on Sunday, June 22nd, 2014 at 9:50 pm. It is filed under Story Archive and tagged with IB Patch, Imperial Beach Patch. You can follow any responses to this entry through the RSS 2.0 feed.